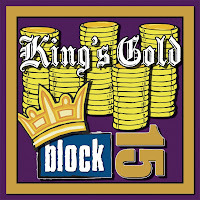 Today I spent some time with Nick Arzner, founder and assistant brewer at Block 15 Restaurant and Brewery in Corvallis tasting an upcoming release – King’s Gold. This brew is an interesting fusion of the Oregon microbrew and wine industries. King’s Gold starts its life as Golden Glo, the pub’s crisp and refreshing Golden--light in body and brewed with all organic grains. For this batch, instead of kegging it off the beer was sent to a used King Estate Pinot Noir oak barrel for aging. The name of the beer, of course, is a play on the winery and base of the beer. The idea for this brew was borne in a conversation between Arzner and brewer Steve van Rossem, who has some contacts at King Estate and knew he could easily get an old barrel. Arzner said that many breweries age beer in old bourbon barrels, but not many use wine barrels so this was a perfect endeavor for a small brewery like Block 15, where they have the ability to experiment with different and unique beers. After aging in the wine barrel for about 6 weeks, this beer is about ready to go out with a 5% ABV and 20 IBUs. Nick thieved a glass out of the barrel for me pre-release, and immediately I noticed an aroma similar to the Golden Glo but with the added hint of oak and a fruitiness reminiscent of Pinot Noir. In terms of color, this beer is a bit darker having taken on an oaky look. I found the beer to be easy drinking with a subtle oak and pinot flavor, with the fruit coming out on the finish. Arzner described this as a connoisseurs beer in that it takes a subtle palate to pick up and appreciate the changes from their golden. I’m not sure that someone who didn’t know how this beer was made could tell it was a pinot flavor, although once you know "there it is". The more the beer breathed the stronger the oak and pinot odor came out, and with more carbonation I think it will have a very nice aroma. Basically, this beer is a sexier version of the Golden Glo with a wine twist. It’s a bit sweeter, so may pick up a niche following as a result. Arzner is quite pleased with the outcome. He didn’t quite know what to expect but was concerned that the oak would overpower – which didn’t happen. There are only 4 kegs of King’s Gold that will be released in the next week or two, so I expect it to go quickly. Folks will probably select this beer for the shear novelty of aging in a wine barrel, but will continue drinking it due to the enjoyable flavor and drinkable quality. I certainly enjoyed my taste.